Former Defence Secretary Gotabaya Rajapaksa who was in Kandy today, responded to questions posed by journalists. 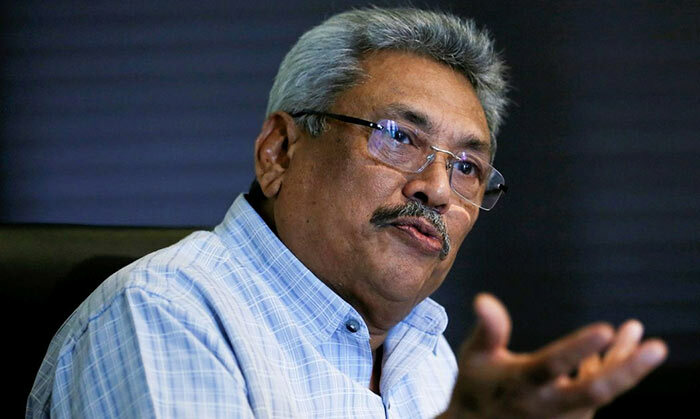 When questioned if there are any issues concerning his capability of running for President in 2020, Gotabaya Rajapaksa said that there was no issue but added with a smile that he had constantly said it should be Former President Mahinda Rajapaksa who should select the Presidential candidate. Journalist D.B.S. Jeyaraj recently published a statement made during a meeting between outgoing United States Ambassador to Sri Lanka Atul Keshap and Former President Mahinda Rajapaksa. The article states that the United States and other Western countries are not in favour of the idea of Gotabaya Rajapaksa being elected President. When questioned about this media report the Former Defense secretary simply said that he does not believe that the US ambassador would stoop that low. Neither the US Embassy nor Ambassador Atul Keshap have officially publicized such a statement as being made during his meeting with Former President Mahinda Rajapaksa. The Former President’s Media Unit issued a release to the media yesterday, saying it has not released an official statement regarding the meeting with the US Ambassador. I challenge even to nominate at least any other politician e except Rakapakse family members for presidential candidacy. Everything is Rajapakse family. After this time, Namal or any sub-ling of Rajapakse mafia..
Why should Mahinda Rajapaksa select the next Prezzy Candidate? What right or position does he have? Is Mahinda Rajapaksa the owner of Sinhala-Buddhist Sri Lanka? Mr Gota, Mahinda Rajapkasa is not even the boss of a leading political party. The Boss of the Blue party is Pallewatte Gamaralalage and the boss of the Green Party is Ponil Wickremasinghe and the boss of the red party is Anura Kumara Dissanayake and the boss of the Tamil Terror Party is Sampanth, the dead man walking. Rajapaksa is a sort of generic name and is led by none other than Mahinda rajapaksa, Constitutionally Mahainda cannot nominate himslef for the presidency and the Rajapaksa clan will will not challenge anyone that Mahinda nominates regardless he is a rajapksa. Then ultimately it is the will of the people that would ultim ately decide the presency and it is unlikley that a UNP nominee will ever be elected a into the officeof presidency. Only a stupid younger gen leader like Ruwan Wijewardane can recommend UNP tap into the majority Sinhala Buddhist vote. As Zama says, the UNP simply doesn’t have a chance of winning a Presidential Elections; they are a bunch of Yankee Wimps with no testicles to safeguard the nation’s sovereignty. In 1977, the JRJ juggernaut swept the board and the present leader Wimpy Wicks was just a ‘spare wheel’ in this juggernaut. Sajith P is too corrupt to be leader; other younger gen leaders like Sujeeva S have been exposed. Three more UNP parliamentarians are to be exposed in the PTL/Mendis Arakku payroll in the coming weeks. GR is well on his way to Janadhipathi Mandiraya with Yasa Palana thrown into the rubbish heap at the next Prezzy Elections. He will not be able to cancel his US Citizenship as there are several ongoing court cases in the US filed against him for war crimes by Tamil Diaspora.